In June, the Science Policy Research Unit (SPRU) based at the University of Sussex and the Tanzanian Government Commission for Science and Technology (COSTECH) co-hosted a workshop in Dar es Salaam to discuss Transformative Innovation Policy and a Consortium that SPRU and partners set up in September 2016 to develop new thinking about science and innovation policy. The Transformative Innovation Policy Consortium (TIPC) aim to address global challenges, such as access to food and energy, rising inequality and climate change, by strengthening the formulation, implementation and governance of science and innovation policies. To achieve this aim, TIPC is currently working with a network of scientists, experts and policy officials in institutions across various countries. The founding member countries are Colombia, Finland, Norway, Sweden, and South Africa, in addition to SPRU which is responsible for the coordination of TIPC programme and activities. TIPC approach argues that science, technology and innovation (STI) policies based on Research and Development (R&D, referred to as Frame 1 in this context) and the National Systems of Innovation (NSI, i.e. Frame 2) alone are inadequate to sufficiently tackle social and environmental challenges. As a result, a re-think of R&D and NSI-dominant STI policies is necessary. Put in another way, a new (third frame, i.e. Frame 3) way of conceptualising, formulating, implementing and governing STI policies is needed (Schot and Steinmueller, 2016). We point out that Frame 3 thinking, framework and underpinning theories are still emerging. 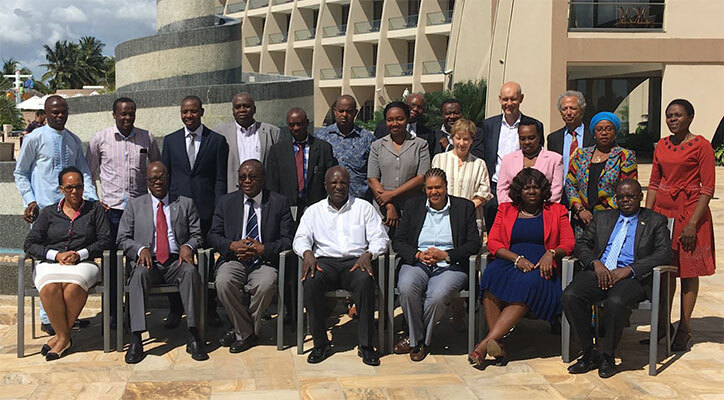 The two-day workshop offered a valuable opportunity for participants to think about the value of TIPC ideas and the Three Frames approach in the Sub-Saharan African context. At the workshop we were joined via Skype by Imraan Patel, a Deputy Director-General at the Department of Science and Technology (DST) in South Africa. DST and the South African National Research Forum are founding members TIPC. Mr Patel spoke about the ways in which TIPC has encouraged reflection and learning in South Africa with respect to integrating specific social, economic and environmental policies into science and innovation policy targets and to develop a framework for learning from experimentation. Workshop participants highlighted the relevance of the TIPC policy framework which focuses on the way in which STI policies can directly impact on issues such as inclusion and inequality, unemployment and poverty, and costs caused by environmental degradation. At the same, participants discussed the need to also focus on the overlaps and synergies between different frames and particular between innovation systems thinking and analysis, and transformative policy thinking. This includes maintaining a focus on critical issues that are pertinent in Africa’s context – such as economic growth, technology transfer, learning, and capabilities building – and bring new analytical insight into how those issues relate to efforts to steer science and innovation to address specific critical socio-economic and development issues. Participants were particularly keen to underscore the importance of economic growth in the Sub-Saharan Africa (SSA) context and emphasised the need for TIPC approach to take this into consideration. Thus, participants agreed that TIPC perspectives fill an important gap in analytical and policy narratives. Participants suggested that some issues may be particularly important in Low and Middle Income Countries (LMICs) contexts and need to be understood in relation to individual countries’ specific situation. It was agreed that theoretical frameworks can guide and inform research and policy but, given the nascent character of Frame 3 thinking, experimental approaches which reflect local experience, priorities and knowledge need to predominate. Therefore, in line with the priorities of some of the existing TIPC members, transformative growth in SSA context should inform new approaches to generating sustainable economic growth and development that does not exacerbate inequality and exclusion of marginalised segments of the society. The discussion echoed themes which have arisen out of initial TIPC review work (Chataway et al, 2017a/b). A review of science and innovation policies in existing TIPC members noted that all countries have elements of Frame 3 initiatives and thinking but deploy frame 3 type policies in different ways. Policies reflect different priorities and cultures. The review also pointed to a lack of clarity in the concept of transformative innovation. In some respects this lack of clarity can be considered a weakness. At a practical level, it creates difficulties in explaining what the overall aims and objectives of TIPC are and at a theoretical level it limits the extent to which current thinking about transformation and transitions can refine thinking about causality and direct empirical work (Schot and Kanger, 2016; Sorrell, 2017). However, the lack of clarity is also important for TIPC. It corresponds to the emphasis within the Consortium on using experimentation to not only provide policy alternatives but also to build on existing theoretical and conceptual architectures. Further issues raised by participants, with the hope that TIPC programme may help address through policy mixes, include: technology transfer, which was stated to be a major challenge in Africa, greater than R&D; the threat of digitisation and artificial intelligence in relation to job creation and employment opportunities. Suggestions were offered on the need for TIPC to also engage with regional government bodies and policy agencies such as African Union (AU), AU RECs (Regional Economic Communities) and continental level decision-makers, policymakers. Such engagements will help to demonstrate TIPC’s value addition to Africa’s STI policies and policymaking while also helping to raise awareness on TIPC’s aims and ambitions, core arguments, theoretical underpinnings and conceptual framework, and methodologies to not only decision makers and policymakers but also researcher in STI and public policymaking. In conclusion, the workshop was a good opportunity to receive valuable feedback on TIPC programme and activities. Participants were in agreement with TIPC aims and objectives, which they agreed are in line with the Sustainable Development Goals (SDGs) and global mega trends. The highlight of the event was the expressions of interest by some of the countries to join TIPC, while the other countries expressed willingness to explore TIPC further, remain engaged and possibly join in the future. The authors would like to thank the workshop host, COSTECH, and workshop participants from Botswana, Ghana, Kenya, Namibia, Nigeria, Tanzania, South Africa, IDRC, SADC and UNCTAD for their participation and helpful comments. The usual disclaimers apply. Developing and Enacting Transformative Innovation Policy: A Comparative Study.